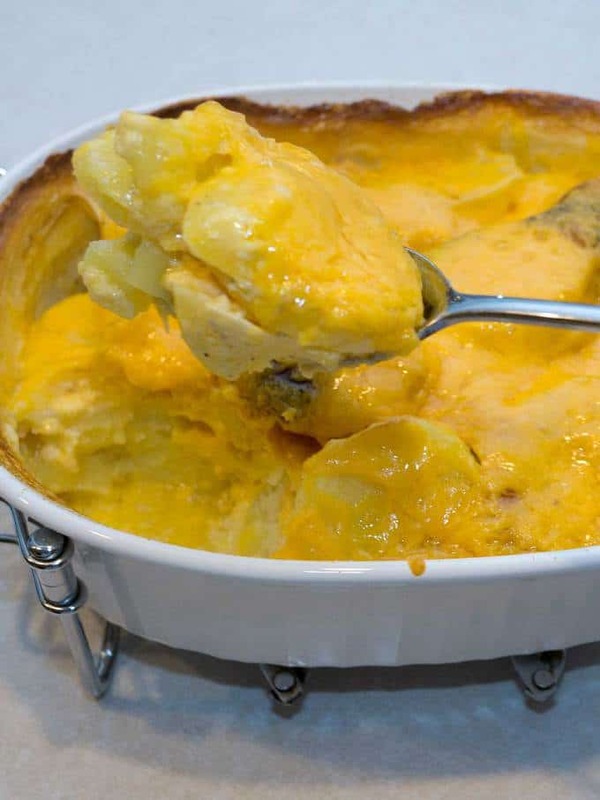 Full of cheesy goodness in every bite, my Mother’s Southern Style Scalloped Potatoes are perfect for any occasion. This is especially true for Easter! I basically make them the same way that my mother made them years ago – by layering the ingredients. Then I finish it off with the addition of milk for cooking, and shredded cheese at the end. 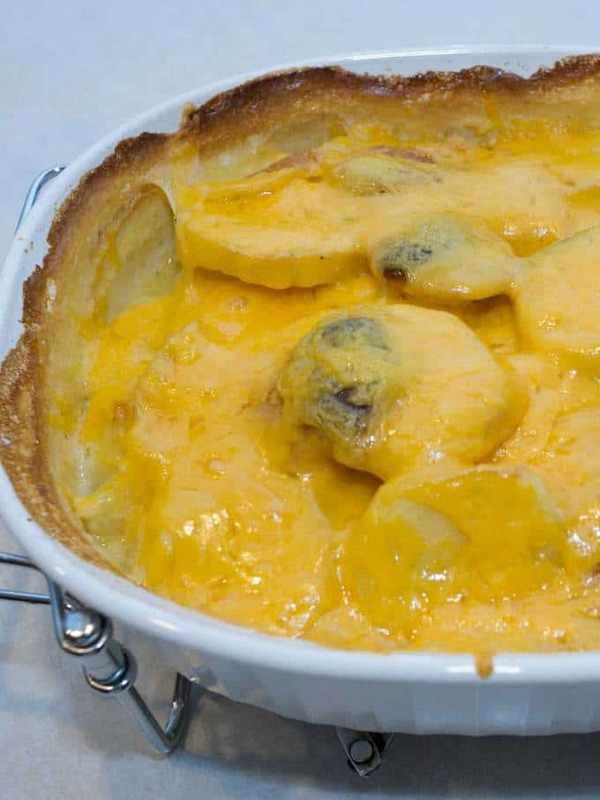 I used the following ingredients: Potatoes (I’ve used both russet and Yukon gold potatoes), Kosher salt, freshly ground black pepper, all purpose flour, unsalted butter, Velveeta cheese, milk and shredded Cheddar cheese. I started by peeling the potatoes and slicing them to a thickness of about 1/4-inch. Then, I cooked the potatoes in salted boiling water just until they started to soften, 4 to 5 minutes, and drained them in a colander. I didn’t want to over cook the potatoes at this point because they continue cooking in the oven. 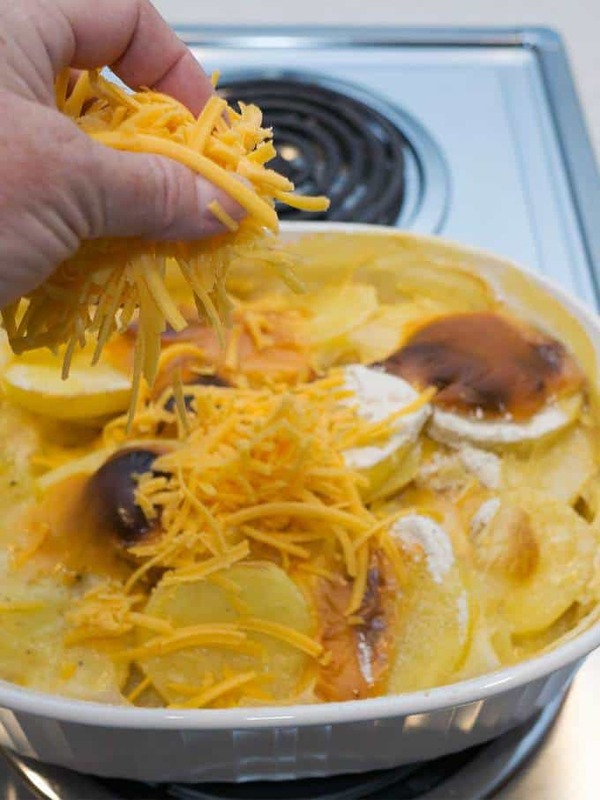 To build the scalloped potatoes, I added about 1/3 of the drained potatoes to a large casserole dish. Then, I sprinkled 1/3 of the flour (about a tablespoon and a half) on the potatoes, and added some freshly ground black pepper. 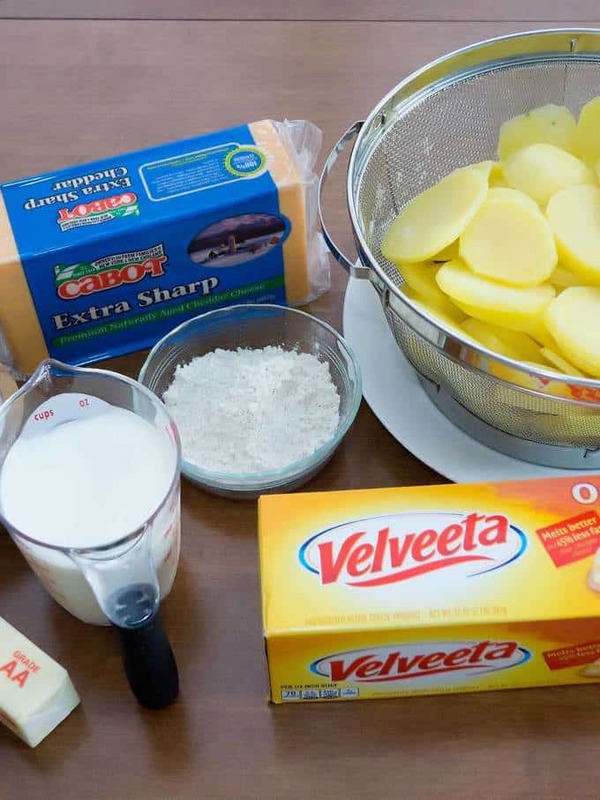 Next, I dotted 1/3 of the butter (about a tablespoon and a half) on the floured potatoes, and ended the layer with several slices of Velveeta cheese (about 2-1/2 ounces). I repeated this process 2 more times, for a total of three layers. 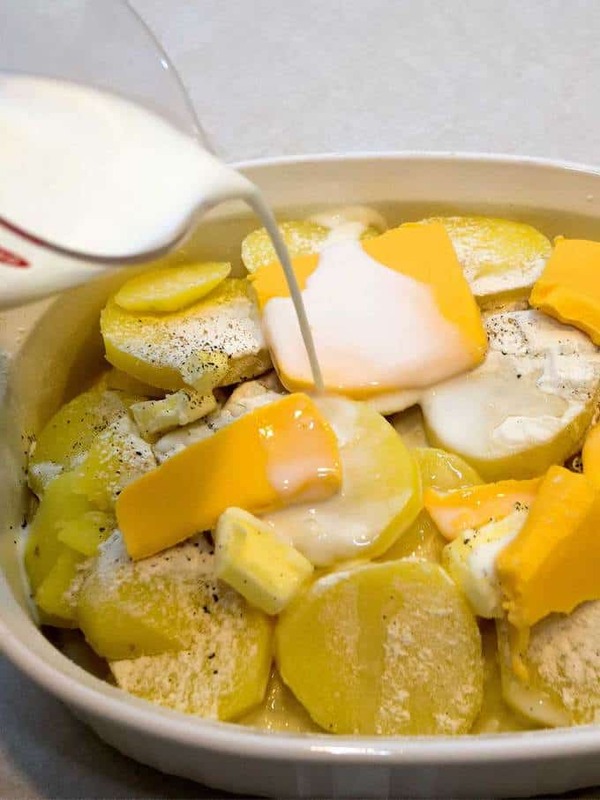 Before putting the potatoes in the oven, I added 1-1/4 cups of milk. I popped the potatoes into a preheated 375° F oven the for 50 minutes. After 50 minutes, I removed them from the oven, and sprinkled shredded Cheddar cheese on top. I returned the potatoes to the oven for an additional 10 minutes, until the cheese was melted and bubbly. What can I say? They taste as good as they look! As an added benefit, they make outstanding leftovers, and go well with a lot of main dishes. Yum! 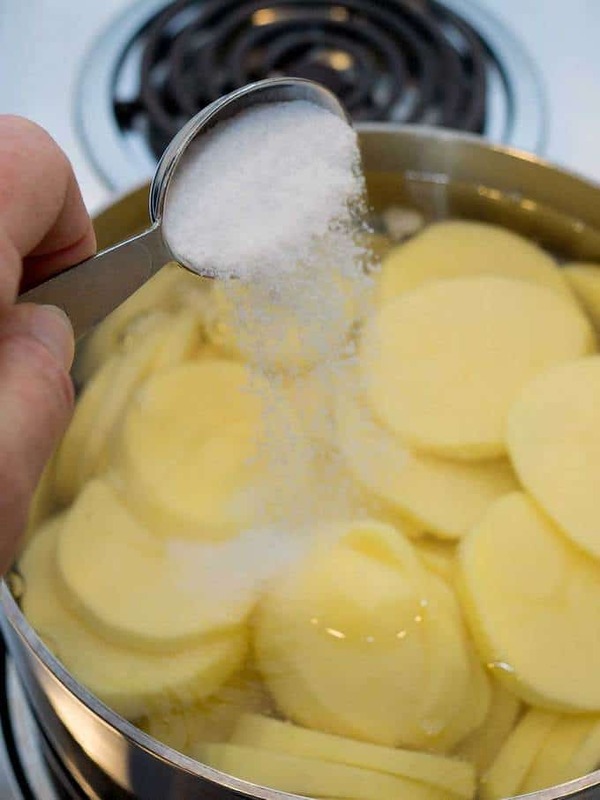 Cook potatoes in large pan with water salted with 1 tablespoon of Kosher salt just until tender, 4 to 5 minutes after the water comes to a boil. Drain in colander. 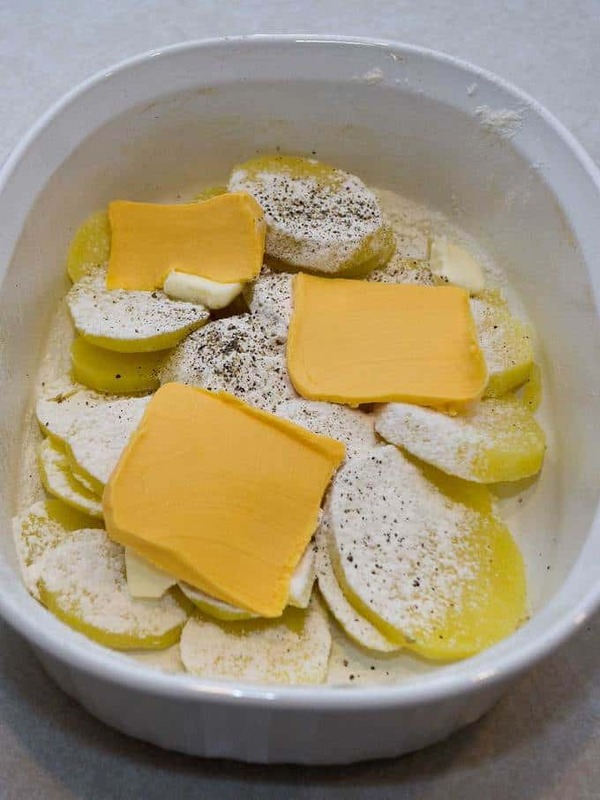 In a large casserole dish, layer the ingredients as follows: 1/3 of the drained potatoes, 1/3 of the flour (about 1 1/2 tablespoons), 1/3 of the butter (about 1-1/2 tablespoons), freshly ground black pepper, and 1/3 of the sliced Velveeta cheese (about 2 1/2 ounces). Repeat for 2 additional layers. Pour milk evenly over the top. Bake in a preheated oven for 50 minutes, or until top is browned and mixture is bubbly. 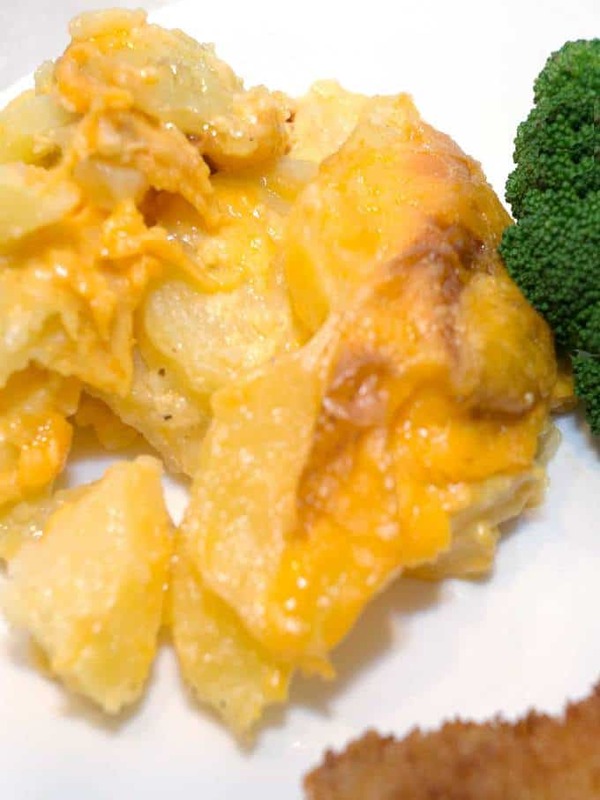 Remove from oven and top with shredded Cheddar cheese. Return to oven and bake for 10 more minutes, or until cheese is melted and bubbly. Remove from oven and serve.